1. Thank the person who gave this award to you and link it back to their blog. 3. Pass this award to 8 other individuals that you have recently discovered. 4. Leave a comment so they can pass along the recognition. 1. I have been married 33 years to my wonderful husband Rich and we have one son and one daughter. 2. I am a grandmother of two. My wonderful 3 year old Thomas, and beautiful 1 year old Evelyn. 3. I love my job! Being a SU demonstrator allows me to be creative every day, as much as I want, or as little as I want. I am having so much fun!! 4. I love spending time at the beach with family and friends. 5. I am a retired pre-school teacher, and while I miss the time spent teaching little minds, I now enjoy teaching and sharing my SU creations, techniques, and ideas with others. 6. I try to stay in shape by going to the gym, doing yoga, and running, but know that I have to work harder at it than I did in the past. 7. I have the best friends in the world who are always there for me during the good and the bad and they help make my life complete. 8. I have the best family in the world, and without them my life would not be as fulfilled as it is now, and I thank God everyday for these blessings. Now I would like to pass the Stylish Blogger Award to these following ladies. Please visit their blogs when you get a chance! These are just a few of the great blogs I follow, and when you get the time stop on by to check them out. Eileen, what a pleasant surprise! 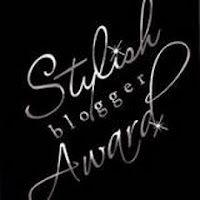 Thanks so much for the blog award! Off to visit your blog! Thank you so much for the award. You out a big smile on my face!